Description: French Antilles. Guadaloupe to Martinique. Original colour. Description: Martinique, one of the French possessions in the West Indies. Original hand colour. Description: Martinique. Detailed map of the Island showing religious divides. Original colour. 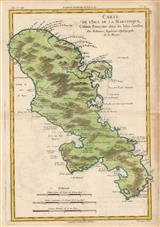 Description: Interesting small map of Martinique, now a French overseas department in the Windward islands. Coloured. Description: Bay and town of Fort Royal. Decorative chart with original hand colour. Description: Martinique. Inset Guadeloupe. Coloured. Description: Martinique. Detailed map of island done from actual surveys and observations made by English engineers whilst the Island was in their posession. Coloured. Description: Martinique. Miniature map. Coloured. Description: Martinique. French text. Fine original colour. Description: Decorative map of Martinique surrounded by local scene, highlighting tobacco industry. Original outline colour. Description: Map surrounded by decorative scene showing local dress and wares. Original printed colour.